The next release of Cyber Knights may not only feature the new story mode, but will also include the second of the user interfaces updated to the new style. If you saw and enjoyed the dialog updates, this one rides in the same style. 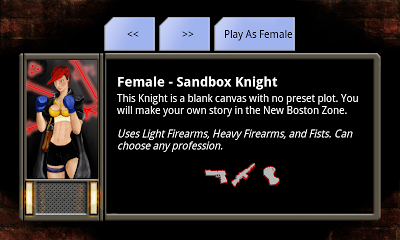 Some other major enhancements to the New Character screen include listing weapon types available, displaying representative icons for those weapon types, as well as making clear any profession limitations implied by a character choice. Can't wait to see this on the market!